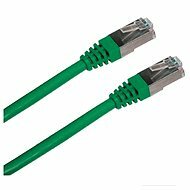 This FTP patch cable (pan-shielded twisted-pair) with two RJ-45 connectors is designed to connect devices to computer networks (eg for connecting a PC to a HUB).The FTP cable is based on the better-known STP type and has self-shielded pairs. Inside the cable, there is the shielding and four pairs of wires. This type of cable is used in places with high levels of interference. The length of this cable is 3m. 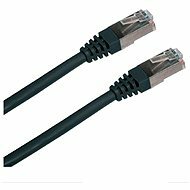 For shipping to other EU countries visit this page Datacom, CAT5E, FTP, 3m, black. 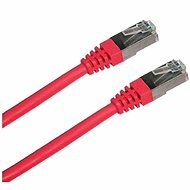 Für Versand nach Deutschland, besuchen Sie bitte Datacom KAT.5E FTP Netzwerkkabel 3 m schwarz. Chcete doručit zboží do Česka? 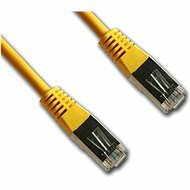 Prohlédněte si Datacom CAT5E FTP černý 3m. Chcete doručiť tovar na Slovensko? Prezrite si Datacom CAT5E FTP 3 m čierny. 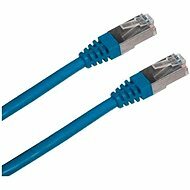 Für Versand nach Österreich, besuchen Sie bitte Datacom KAT.5E FTP Netzwerkkabel 3 m schwarz. Magyarországra történő kiszállításért tekintse meg ezt a termékoldalt: Datacom CAT5E FTP fekete 3 m.